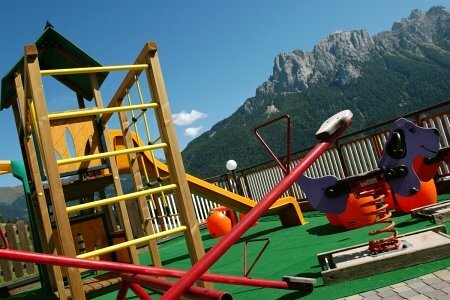 Hotel Fontana in Vigo di Fassa, at the foot of the most beautiful Fassa Valley mountains, the Dolomites, has 80 rooms: all en-suite equipped with hairdryer, a direct telephone line, safe and satellite TV with Mediaset Premium. The suites, spacious, welcoming and fully furnished in wood, are composed of two adjoining rooms with one or two bathrooms. Almost all with balcony, telephone, safe, LCD television with Mediaset Premium, wireless Internet, fridge and bathroom, in various sizes. With a terrace, made up of two adjoining rooms furnished entirely in wood, for four, five or six guests, with a bathroom, two LCD televisions with Mediaset Premium, wireless Internet, telephone, safe and fridge. Made up of two adjoining rooms furnished in warm and welcoming colours, with a Tyrolean Stube, two terraces with views over the Dolomites, with one or two bathrooms, complementary bathroom products, two LCD televisions with Mediaset Premium, wireless Internet, telephone, safe and fridge.